I’ve been blessed when it comes to Fortune. Though I’ve had her since she was 3 months old, and she turned 19 last month, we’ve never had many major issues. An abscessed tooth when she was 2ish, some thrush when she was stalled, but for the most part we’d escaped major injuries and issues. A hot early summer Saturday, I stepped out to do morning feeding to find Fortune dead lame in her hind foot and blood running down it. I won’t post pictures, but I believe she got her foot caught in something in the pasture and cut the heck out of the back of her hind pastern. It was Saturday. The normal vet doesn’t have after hours or emergency hours. So I turned to google, The duct tape and baby diaper bandaging protocol was recommended and within the budget. I had to go get groceries anyway, so I added those to the list (I had the other first aid supplies), made sure she had water and would be okay in the run-in shed, and went to get the items. Nevertheless, I persisted. 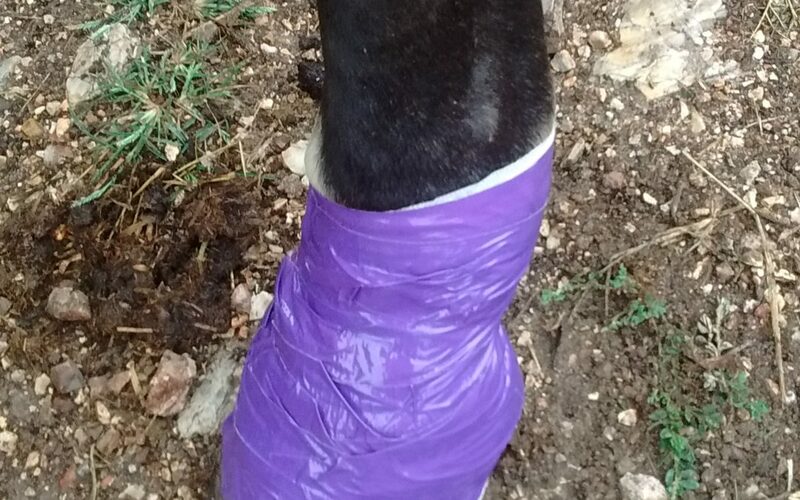 Daily bandaging, after cleaning with first sterile, then distilled water, putting vetricyn on it, then wrapping it. I quickly learned hot pink or purple or blaze orange duct tape–bright colors–could be seen from the house so I could make sure she kept her bandage on. And I waited for the vet to come. He never did. At about the six week mark, though I was relatively sure we were doing fine (no infection, visible healing, etc.) I posted in the Horse Vet Corner group on Facebook….no reply. This pattern was seriously messing with my anxiety. Luckily, a vet tech in one of the groups I posted in offered to look at the pictures. She did, said I was doing a good job and made a few suggestions. I’ll forever be thankful for her. We are continuing to bandage and heal and we’re doing great. I did have a vet out earlier this week and he confirmed that I’m doing great. Gave me a wound ointment for it that he recommends and we’re just keeping on with our protocol. Healing is progressing and that’s the important thing. Have a well stocked first-aid kit. My items were kind of scattered around. This galvanized me to put them all in one location. It helps to have support. Mom’s an RN who worked in wound-care. I’ve dealt with assorted pet situations over the years and am working toward my Agriculture degree. Know who you can reach out to. Breathe. Don’t panic. Remember they will get into trouble all on their own. Do dilligent pasture management. Don’t “assume” everything is okay. Find sources of potential injury and remove them sooner, rather than later.